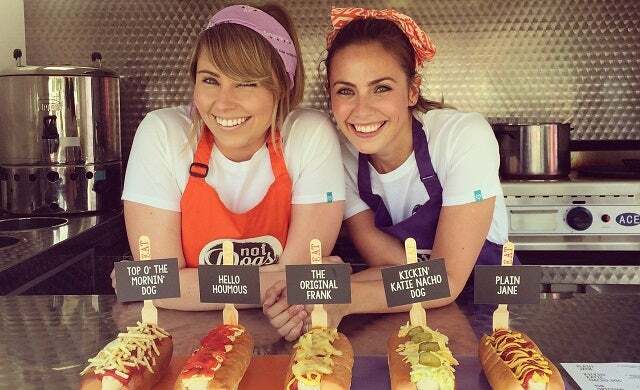 Awarded £150,000 as the November competition winner, the Not Dogs founders plan to take their veggie hot dogs to customers "up and down the country"
Until now, fast food has always been associated with meaty snacks: think greasy beef burgers, fried chicken and neon pink hot dogs. But where does that leave those among us who fancy a hearty, speedy meal but happen to be vegetarian, vegan, or even just not big fans of meat? Enter Not Dogs, the vegetarian fast food brand that’s challenging our assumptions about the industry, and has been crowned winner of the November Start-Up Series competition. Submit your entry for the latest Start-Up Series competition. “We were talking about the festival scene, and how there’s not really anything that both of us could eat that we would actually really enjoy.” Looking to provide a better choice for themselves, the duo picked a product that McDermott says she “would struggle to eat, but would actually love to eat” – the hot dog. With Yates inspired by the meat-free fast food she’d seen come into prominence in Australia, the duo set about experimenting with unique toppings on Quorn bratwursts. Within three months, they had a food truck with which to test their product on the public. Donning their trademark hot dog costumes, McDermott and Yates drew plenty of crowds and have fostered a powerful social media following; not least due to their ongoing #SausageSelfie competition. The duo, who met six years ago at a PR agency, say their backgrounds in heading up national PR and social media campaigns gave them the know-how to engage their customers online. Having realised that Not Dogs could be “more than a food truck”, in January 2016 the fast food entrepreneurs closed a successful crowdfunding round which helped them “kick off the hunt for a permanent restaurant”. However, the duo struggled to secure further finance: “There’s a lot of investment out there, but a lot of it is very business-to-business, so we struggled with knowing where to go.” The pair even pitched on the BBC’s Dragons’ Den, but didn’t get the investment they were looking for – though they were happy with the Dragons’ “great reaction” to their food. Enter your business for the Start-Up Series here. First, the entrepreneurs submitted a detailed business plan and video, a process they describe as “really fun”: “Making the video for the team was really exciting – we obviously enjoyed being in front of the camera!” They then qualified for the next stage – a telephone interview with Worth Capital. “It wasn’t a hard sell […] it was quite different to Dragons’ Den,” they add. Now with a four-month-old restaurant in Birmingham’s Bullring, the pair say that with Worth Capital’s investment they are “spoilt for choice” on what to do next; though their immediate plans are to introduce “exciting improvements” to their restaurant’s in-store design, as well as open a second location.